Mary-Kate Olsen’s Phone Background Is Shockingly AverageIt’s a cute photo of her and her husband. Oh My God, the Olsen Twins Should Have Taken Over CélineHow did we not think of this before? 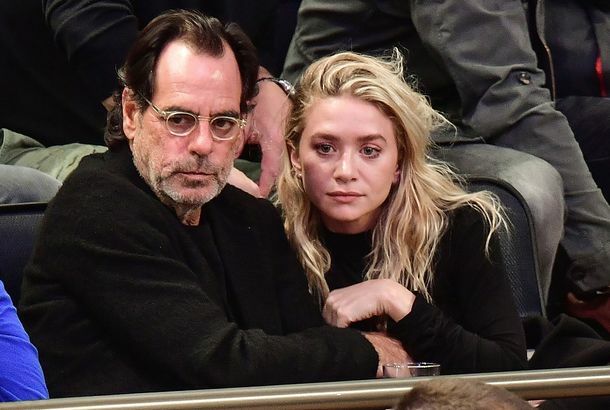 Ashley Olsen Reportedly Broke Up With Her 58-Year-Old BoyfriendWe’ll always have those photos of them hiking in St. Barts. The Olsens’ Former Interns Are Getting a Whopping $530 Each in SettlementAfter they filed a class-action lawsuit against the designers. Mary-Kate and Ashley Olsen Predicted Hillary Would Be President Back in 2001The twins were political prophets as teens. Our Scowling Hero Breaks a SmileShe was on vacation. Did You Know Mary-Kate Olsen Shows Horses?She’s a card-carrying member of the billionaire girls pony club. Mary-Kate and Ashley Olsen Take a Smoke BreakHere’s your Thursday-afternoon moment of Zen. Mary-Kate Olsen’s Wedding Was Cooler Than YoursParty décor: bowls and bowls of cigarettes. Want Soft Hands? The Olsen Twins Can Help.Their latest beauty launch is surprisingly effective. The Olsens Respond to Intern Lawsuit, Deem It ‘Groundless’Their spokesperson issued a statement. Report: Interns Are Suing the Olsen Twins for Ridiculous Hours and Lack of PayThey’re facing a class-action lawsuit. All the Olsens Want for Christmas Is a ‘Price Upon Request’ LighterStaying on brand. The Row Made ‘Affordable’ Backpacks for NormalsA mere four figures! Mary-Kate Olsen Broke Her 5-Hairpin Rule Last NightEveryone makes sacrifices for the Met Gala. Mary-Kate and Ashley Olsen Played a Fun Game on EllenIt was an accusatory twin game. Mary-Kate Olsen Has an Outstandingly Large Engagement RingIt’s a ring-finger workout. Mary-Kate Olsen and Carla Bruni Will Be SistersJust what she needs. More sisters. Mary-Kate Wants a Baby and a Ring and a Partridge in a Pear TreeA Christmas list develops. Mary-Kate Olsen Not Leaving the Ring Up to Olivier SarkozyShe’s been shopping at Neil Lane. People Have Such Dumb Opinions About the Olsens, Olsens SayIt’s pretty confusing, what they do, but they’re gonna try to explain it. Mary-Kate Olsen Has a Five-Hairpins-Only RuleAnd other Olsen beauty secrets from their hairdresser, Mark Townsend. My Five Final Backstage-Beauty LessonsTime-traveling hair, bathroom facilities, and party feathers. Givhan: Child Stars With Old Souls, the Olsens Age Gracefully at The RowThe fashion equivalent to becoming wiser, more confident, and more capable. Mary-Kate Olsen’s Perfect Slicked-Back HairIt’s one way to deal with bed head. Try Mary-Kate Olsen’s Textured Menswear LoafersSimple and understated. Mysterious Coat Overshadows Mary-Kate Olsen’s ‘Mystery Man’Who wears a coat in this weather? GIF Tutorial: Give Yourself a Brushless Blowout Here’s how to get hair with mega-volume. Happy 27th Birthday, Olsen Twins!Still can’t process the fact that they’re fraternal after all these years. 23 Blondes Turned Brunette: A Slideshow Inspired by Betty on Mad MenTime to get serious. Knicks Games a Potent Aphrodisiac for Mary-Kate Olsen and Olivier SarkozyGet a room (more private than MSG)! Olsens’ Lower-Priced Handbags Will Look Great With Your Venti Starbucks CupThey won’t cost $39,000! Damien Hirst’s Backpacks for the Row Are Selling FastThey’re $55,000 each. Olivier Sarkozy’s Ex-Wife ‘Loves’ Mary-Kate OlsenOr maybe she just wants free clothes. GIF: Olivier Sarkozy Kisses Mary-Kate Olsen at the Knicks GameThe Cut makes a Kiss Cam.